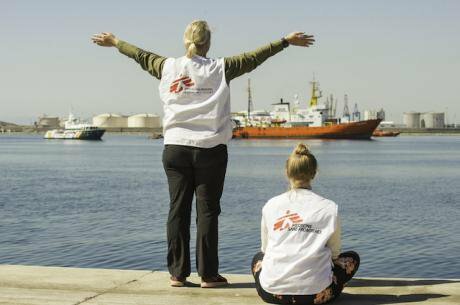 17 June 2018, Spain, Valencia: The refugee rescue ship 'Aquarius' which was rejected a week ago from Italy and Malta has arrived in port. Daniel Duart/Press Association. All rights reserved. Would it not be better for migrants to “stay home” rather then reach a Europe which has turned its back on them and which they threaten in turn? Whispering or shouting, reluctantly or aggressively, European citizens increasingly wish migrants would simply disappear. Whispering or shouting, reluctantly or aggressively, European citizens increasingly wish migrants would simply disappear. Over the last 30 years, for every route states have succeeded in closing, it has only been a matter of time before migrants opened several new ones. Forced to use precarious means of travel – often controlled by criminal networks, migrants’ lives were put at growing risk. More than 30,000 migrants are recorded to have died at sea since the beginning of the 1990s. A sea which has connected civilisations for millennia has become a mass grave. More than 30,000 migrants are recorded to have died at sea since the beginning of the 1990s. A sea which has connected civilisations for millennia has become a mass grave. State policies can only create a legal frame for human movement to unfold and thereby partly organise it, they cannot block it. Only a more open policy would allow migration to unfold in a way that threatens neither migrants themselves nor European citizens. No longer policed through military means, migration could appear as a normal process that does not generate fear. States could better detect individuals that might pause a threat. In effect, the EU’s policy has mostly resulted in the use of development aid to impose policies of migration control on countries of the global south. In the process, the EU is lending support to authoritarian regimes – such as Turkey, Egypt, Sudan – which migrants are fleeing. The EU is lending support to authoritarian regimes – such as Turkey, Egypt, Sudan – which migrants are fleeing. Beyond its lack of coherence, the EU’s so-called “global approach” suffers from one-sidedness, focused as it is on migration as “the problem”. Policies of closure have failed to end illegalised migration and only fuelled the rise of the far-right and the disintegration of Europe. Crucially, we must emphasise the commonality of fate that binds European citizens to migrants. Greater equality and solidarity between migrants and European citizens is one of the conditions to defend all workers’ conditions. Greater equality and solidarity between migrants and European citizens is one of the conditions to defend all workers’ conditions.